One of Russia's Sukhoi T-50 prototypes had a very bad day recently, catching fire at the end of a test sortie and the resulting damage is pretty horrific. It is not clear what exactly caused the fire, but the PAK-FA program, although appearing to be moving along swiftly, has its issues, and India, the partner nation in the program, it not happy with the design. I had my doubts as to the aircraft's low-observability right when the airframe was first unveiled, especially considering the engine's first stage fan was not even shrouded from line-of sight in any way. Still, low-observability is not everything when it comes to survivability on the modern air combat battlefield, and it will be even less-so in the future. Yet even for a less aggressive "balanced" low-observable approach, the T-50 in its present form is lacking. So many people love the Russian fighters, especially the massive Su-27 Flanker and its many derivatives, but the aircraft's avionics, and in the T-50's sake its design philosophy, craftsmanship and material science, simply to do not come close to parity with American designs. That is not to say that they cannot be very deadly, especially when used in large numbers against a foe operating in an un-networked battlespace. In fact, I have long wondered just how amazing an SU-27 derivative with all western avionics, including a massive AESA radar to sit inside its huge nosecone, could be. 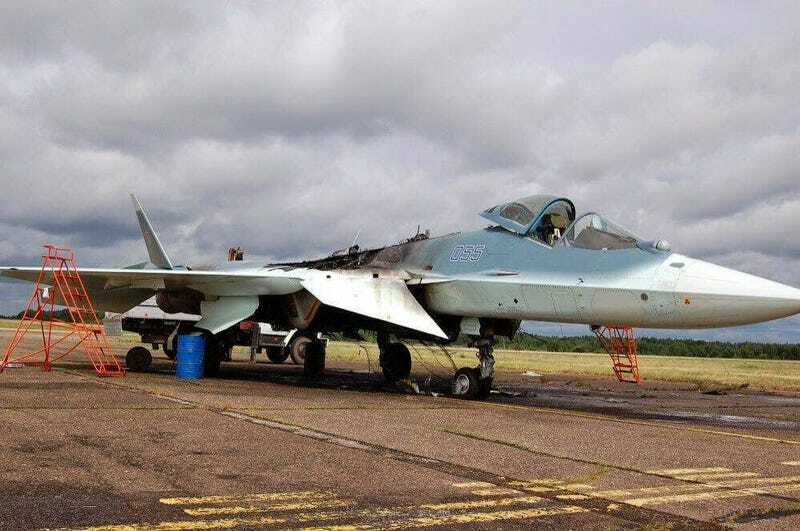 None-the-less, Sukhoi says that the burnt T-50 will be repaired and that the program will not be delayed due to the fire. Recently, the T-50 made other news when pictures of it carrying a heavy external weapons load were making their rounds around the net. Time will tell just how successful the T-50/PAK-FA program will be, and exactly what the aircraft will look like once it has reached operational service, as there have been consistent rumors about a redesign that will decrease the aircraft radar signature. This is a pretty important thing seeing as Russia has billed the T-50 as a stealth fighter. It will be exciting to also see what the jet's final performance numbers will look like as there is little doubt that the design can super-cruise with ease and its thrust vectoring and low wing-loading should make it very maneuverable. Still, with China's ambitious J-20, and even their less aggressive J-31 prototypes having taken to the skies years ago, it would seem that the PAK-FA is far from leading the pack when it comes to advanced stealth fighter designs. But if Russia and India can provide a jet with even a low-end stealth capability, large combat radius, great maneuverability and decently capable avionics, all at a price that is far below western designs such as the F-35, and if they are willing to sell it to less than desirable folks who would never get a shot at purchasing the F-35 in the first place, they may just have a winner on their hands for the foreign export market.